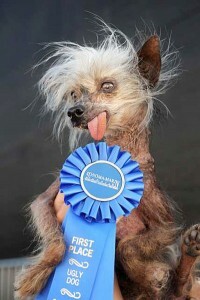 Miss Ellie won the pedigree category of the 2009 World’s Ugliest Dog Competition, but sadly she has now passed away. Chinese Crested dogs have a long and illustrious history of winning ugly dog contests, as the 2008 competition was also won by a Chinese Crested when Gus won the main event. Miss Ellie wasn’t just about being an ugly dog however, as she campaigned to raise awareness for rescue dogs and to raise money for their care. Miss Ellie herself was a rescue dog, as she had been abandoned at the age of 7. She was rescued by her owner Dawn Goehring and given a new home with Dawn’s 13 dogs, all rescue dogs. Some lucky bachelor dog may get the chance to take Nancy on walkies up the aisle at a planned wedding ceremony on Sunday 29th August. Nancy is a 6 month old Chinese Crested pooch and her wedding is planned to take place at the Foxdenton Hall in Chadderton next Sunday. The vicar is booked, her wedding dress is ready and even refreshments are planned, but they are still missing a dog groom! The World’s Ugliest Dog competition was held last weekend at the Sonoma-Marin Fair in Northern California where a boxer-mix was awarded the title. Pictured here is Pabst, a four year old boxer-mix breed with a very prominent under-bite. Pabst was a rescue dog taken in by his owner Miles Egstad. 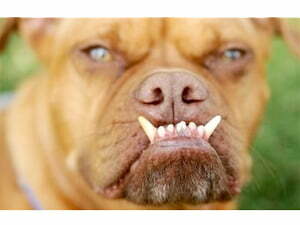 Just as one ugly dog looks for a new home, the world’s ugliest dog has left his. Gus, officially the world’s ugliest dog, has just died, after a battle against skin Cancer. Gus’s owner, Jeanenne Teed, lives in St. Petersburg, Florida. 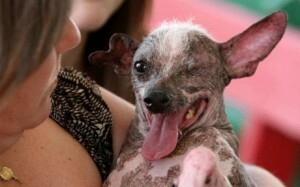 Gus is a Chinese Crested dog with one eye and three legs, and was crowned the winner of the world’s ugliest dog contest in June this year. Upon winning the title, Gus’ owner said that the prize money would be used to help Gus’ radiation treatment for his skin Cancer.